Based on a report by PolitickerNJ, the Boys of Summer have struck in Hudson County once again - this time it's up on the hill from Hoboken in Union City. According to the report, the FBI have swarmed against "alleged misappropriation of Community Development Block grant dollars." The report also notes the raid comes with the backdrop of a political war in Hudson County between the Hudson County Democratic Organization (HCDO) and "renegade" Union City and State Senator Brian Stack. 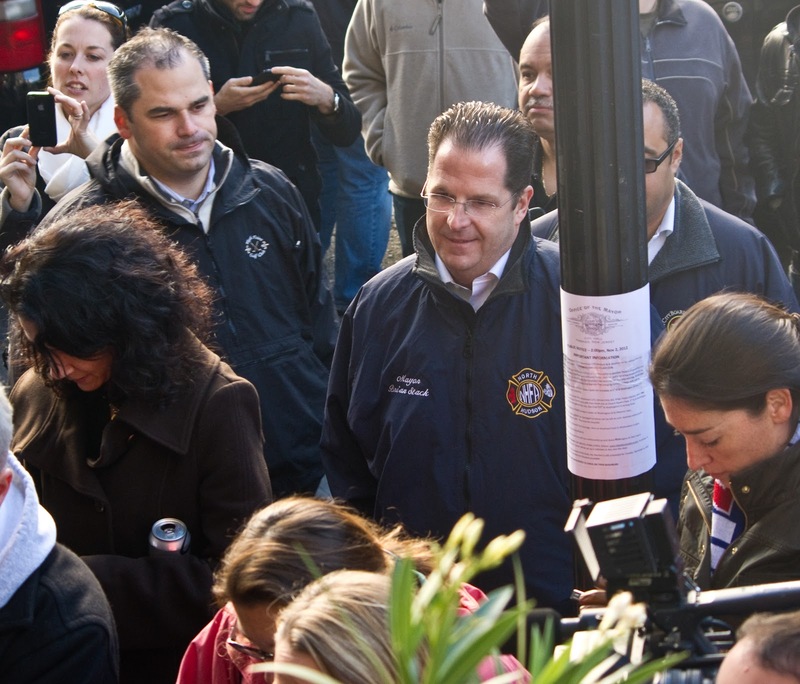 State Senator and Union City Mayor Brian Stack outsidet the Elks Club in Hoboken with Governor Chris Christie. Stack has been in a hot and cold war with the HCDO for years. Now the FBI has arrived at Union City. Talking Ed Note: Hoboken has been completely surrounded short of seeing a raid in neighboring Weehawken by the Feds in recent months. Federal law enforcement raids have taken place in Jersey City (HCIA) more than once, North Bergen, West New York and Union City and points between running all the way to Trenton. In the year and half plus investigation into Hoboken triggered by the massive looting inside the mayor's office with the Data Theft Ring (DTR), the one arrest to date is the IT Manager Patrick Ricciardi who lost his job at that time and was arrested just over a year ago after the 2011 November election. 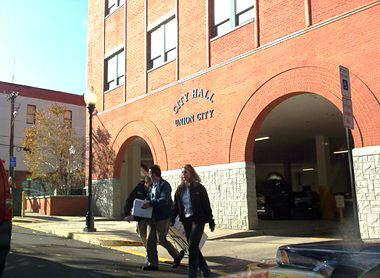 FBI agents leave City Hall with files in Union City this morning. Photo courtesy the Jersey Journal, by arrangement. All Hoboken can say to the US Attorney's Office in Newark is "Don't you forget about me." The Old Guard has arrogantly continued in its dark ways. This latest election cycle will show untold hundreds of absentee ballots coming out of the campaign loving Hoboken Housing Authority once again. Of note, not one candidate in receipt of the one-sided votes from the "campaign workers" based in the HHA has yet to renounce the obvious fraud or the votes that go with the illicit vote-buying practice. During the course of the Federal investigation, Hoboken has seen its institutional culture and very life under attack with an attempt to scuttle the sale of the local hospital and force the City into bankruptcy, subversion of a simple tax status change on the Midtown Garage costing taxpayers over $4 million, and an all out war for control over the BoE preceded by a massive million dollar SLAPP suit against a dozen vocal online opponents of corruption with more political operative abuses linked to Beth Mason.